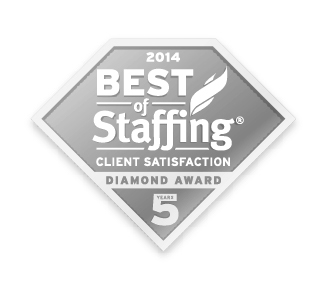 Professional Staffing Group has been named one of Inavero’s 2014 Best of Staffing® Client Award winners and has also earned the 2014 Best of Staffing Diamond Award for achieving five consecutive years of industry-leading satisfaction scores from the clients we serve. Presented in partnership with CareerBuilder, the fifth annual Best of Staffing Award provides the only statistically valid and objective service quality benchmarks in the industry, revealing which staffing agencies deliver the highest quality of service to their clients. In a year when the staffing industry’s client service quality scores are trending down once again, Best of Staffing winners achieved scores significantly higher than industry averages. Less than two percent of all staffing agencies in North America received the Best of Staffing Award for service excellence in 2014. PSG was also among an elite number of firms to win this award for the past five years in a row, earning them the Best of Staffing Diamond Award. Utilizing the Net Promoter® methodology, the winner’s contrast in client satisfaction scores compared to the industry average is a clear indication that winning firms truly stand out for their service quality.